At INTERGEO 2017 in Berlin, rapidlasso GmbH – the makers of the popular LiDAR processing software LAStools – were awarded top honors in both of the categories they had been nominated for: most innovative software and most innovative startup. The third award for most innovative hardware went to Leica Geosystems for the BLK360 terrestrial scanner. The annual Wichman Innovation Awards have been part of INTERGEO for six years now. Already at the inaugural event in 2012 the open source LiDAR compressor LASzip of rapidlasso GmbH had been nominated, coming in as runner-up in second place. Dr. Martin Isenburg, the founder and CEO of rapidlasso GmbH, receives the two innovation awards at the ceremony during INTERGEO 2017 in Berlin. After receiving the two awards Dr. Martin Isenburg, the founder and CEO of rapidlasso GmbH, was quick to thank the “fun, active, and dedicated user community” of the LAStools software for their “incredible support in the online voting”. He pointed out that it was its users who make LAStools more than just an efficient software for processing point clouds. Since 2011, the community surrounding LAStools has constantly grown to several thousand users who help and motivate each other in designing workflows and in solving format issues and processing challenges. They are an integral part of what makes these tools so valuable, so Dr. Isenburg. At the Asian Conference on Remote Sensing 2015 (ACRS 2015) held in Manila, rapidlasso GmbH was honored with the “Green Asia Award” by the Chinese Society of Photogrammetry and Remote Sensing (CSPRS). This award is given to a paper that directs Asia towards a greener future using remote sensing technology. This year’s award commends rapidlasso GmbH on advancing the area of LiDAR processing through their PulseWaves effort. PulseWaves is a vendor-neutral full waveform LiDAR data exchange format and API that simplifies access to full waveform data and allows researchers to focus on algorithms and share results. In the future this technology may prove valuable to improve biomass estimates for carbon credit programs such as the TREEMAPS project of WWF. The society communicated to Dr. Martin Isenburg, CEO of rapidlasso GmbH, that this award was also meant to honor his many years of teaching and capacity building across the Asian region. Since the beginning of 2013 rapidlasso GmbH has conducted well over 50 seminars, training events, and hands-on workshops at universities, research institutes, and government agencies in Thailand, Malaysia, Myanmar, Vietnam, Indonesia, Singapore, Taiwan, Japan, and the Philippines. The on-going LiDAR teaching efforts of rapidlasso GmbH in Asia and elsewhere can be followed via their event page. The award certificate that was presented to Dr. Martin Isenburg by Prof Kohei Cho and Prof Peter Shih during the closing ceremony of ACRS 2015 came with a cash reward of USD 300. The award money was donated to the ISPRS summer school that followed the ACRS conference to top off the pre-existing “green sponsorship” by rapidlasso GmbH that was already supporting a “green catering” of summer school lunches and dinners to avoid single-use cups, plastic cutlery and styrofoam containers. The additional award money was used for hosting the main summer school dinner at a sustainable family-run restaurant serving “happy chickens” and “happy pigs” raised organically on a local farm. The paper “Generating Pit-free Canopy Height Models from Airborne LiDAR” co-authored by rapidlasso GmbH and published in the September 2014 issue of PE&RS (the journal of the ASPRS) was awarded twice at the IGTF 2015 – ASPRS Annual Conference in Tampa, Florida last May. The paper took home the John I. Davidson President’s Award for Practical Papers (2nd Place) as well as the Talbert Abrams Award (2nd Honorable Mention). The “pit-free” CHM paper wins the John I. Davidson President’s Award for Practical Papers (2nd Place) and the Talbert Abrams Award (Second Honorable Mention). The “pit-free” CHM paper is joint work with Anahita Khosravipour, Andrew K. Skidmore, Tiejun Wang, and Yousif A. Hussin of ITC and University of Twente. 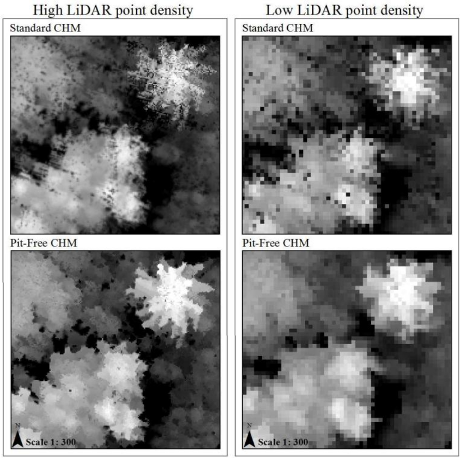 It describes a technique that can create raster Canopy Height Models (CHMs) without the so called “pits” that tend to hamper subsequent extraction of individual tree attributes such as number, location, height, and crown diameter. The paper uses data measured in the field by ITC researchers to show that “pit-free” CHMs significantly lower the commission and omission errors in single tree detection. Visual side-by-side comparison of a “standard” versus a “pit-free” CHM. The “pit-free” CHM algorithm can easily be implemented with LAStools either by modifying an available batch script or by executing the LAStools Pipelines distributed with the toolboxes for ArcGIS and QGIS. A detailed blog article that compares various different methods for creating CHMs is available via the Web pages of rapidlasso GmbH. 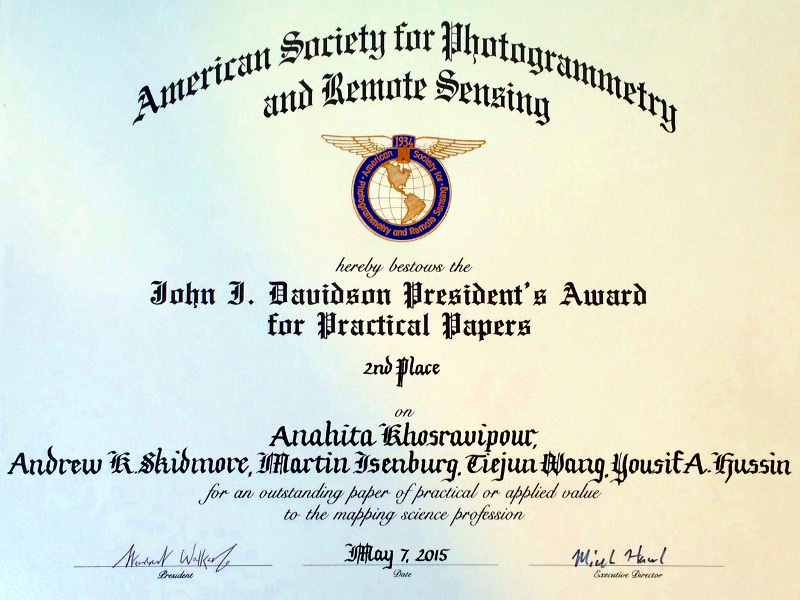 We at rapidlasso GmbH like to especially congratulate the main author, Ms. Anahita Khosravipour, who managed to get two awards with her very first academic publication. Those who like our “pit-free” CHM algorithm will probably also love the new technique that our team will introduce later this year at SilviLaser 2015 in France.